Two sweaters, one green and one brown, are hidden away in the bottom of my cedar chest. I haven’t worn either sweater in decades, yet I won’t part with them. When I was teenager, Mom decided she and I would learn to knit, and Mom’s aunt agreed to teach us, if we were serious and would finish the sweaters we started. The pattern I chose for a springtime green sweater was simple: only knit and purl stitches. But Mom, always eager for a challenge, chose a cable pattern. Before beginning the sweaters, we had to knit perfect squares to pass Aunt Dorothy’s standards. She was a stern teacher. If every knitted row, every stitch, wasn’t perfect, Aunt Dorothy ripped out stitches for us to do over. After supper meals, Mom and I sat together, under a bright floor lamp, and knitted and talked and half-listened to whatever TV program Dad had chosen to watch. When we finally completed the sweater fronts, backs, and sleeves, we took them to Aunt Dorothy and learned how to stitch them together. Mom sewed wool skirts and jumpers to match my two sweaters, and I wore them with pride for years. She continued knitting and made more sweaters and several afghans. But during my years of college and early marriage and teaching and raising children, I didn’t picked up knitting needles. Then about 15 years ago, when a local yarn shop opened, I got the knitting bug and gave scarves for Christmas gifts. When our first Grand was a toddler, I took him to the yarn shop to choose yarn for a knitted cap and now his little brother wears it. But I haven’t progressed past scarves and caps. I read that knitting acts as a natural antidepressant and helps ease anxiety and depression and aids with keeping the brain healthy. 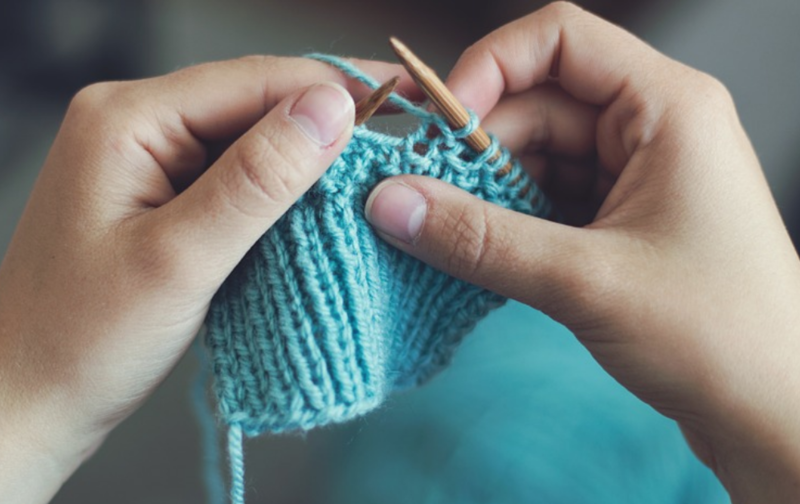 Repetitive knitting motions help the body relax, lower blood pressure and heart rate, and decrease muscle tension. Also, the movements of looping and purling can have the same effects on the brain as meditation. And knitting helps the brain stay sharp because it is engaged and focused. Knitting is a mathematical activity: counting stitches, rows, changing from one stitch to another, increasing and decreasing stitches. What better time to knit than the dead of winter? It’s good way to relax and avoid depression. Everyone can knit – young, old, men, women. And maybe, someone will keep a scarf or cap or sweater tucked away as a happy memory made with love.